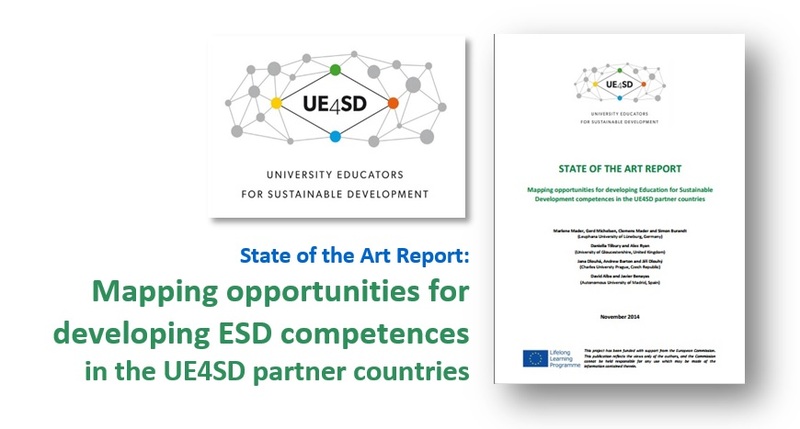 A recently published report, titled ‘State of the Art Report: Mapping opportunities for developing Education for Sustainable Development (ESD) competences in the UE4SD partner countries’, shows that ESD has earned recognition in higher education across Europe and a growing number of universities have formal commitments to ESD as part of corporate sustainability activities. Reflecting on the status of ESD professional development in higher education, the report also notes the variety of approaches in use, examples of innovative practice, and the need for clearer focus on professional competences in ESD. This report, published in November 2014, is part of a three-year project entitled University Educators for Sustainable Development (UE4SD), funded by the European Commission under the Lifelong Learning Programme – Erasmus Academic Networks and led by the University of Gloucestershire. UE4SD is a partnership of higher education institutions (HEI), organisations, agencies and associations across Europe and beyond. This project’s 54 partners across 33 countries in Europe come from four regional hubs: The North region (coordinated by the University of Gloucestershire, UK), the West region (Leuphana University of Lüneburg, Germany), the South region (the Autonomous University of Madrid, Spain), and the East region (Charles University Prague, Czech Republic). Among the partners of this project are two UK universities – University of Gloucestershire and London South Bank University (LSBU). Moreover, activities of this project are closely associated with COPERNICUS Alliance – the European Network of Higher Education for Sustainable Development. Exploring pathways for progressing sustainability innovation in higher education, UE4SD seeks to improve professional development opportunities for university educators in ESD. It strives to develop professional competences and academic leadership capabilities in ESD and to enable teaching staff to reorient curricula and prepare students for understanding and applying their professional and global responsibilities in sustainable development. UE4SD aims to establish a leading expert group in ESD competences in higher education in Europe and a platform for sharing the expertise of network partners with the aim of informing policy and practice. This 54-page report – authored by Marlene Mader, Gerd Michelsen, Clemens Mader and Simon Burandt (Leuphana University of Lüneburg, Germany); Daniella Tilbury and Alex Ryan (University of Gloucestershire, UK); Jana Dlouhá, Andrew Barton and Jiří Dlouhý (Charles Universty Prague, Czech Republic), and David Alba and Javier Benayas (Autonomous University of Madrid, Spain) – analyses the findings of four regional reports, which summarized the national mapping exercises conducted by 53 UE4SD partner institutions in 33 European countries. This study identified existing policy developments and strategic commitments for ESD in higher education across the different countries, and collected the examples of best practice in supporting professional development in this area. This report will inform the second and third phases of the project, which seek to develop a leading practice publication on professional development in ESD for university educators and an online platform of resources. These outputs will in turn support the establishment of an Academy for ESD in Higher Education. Referencing the report: UE4SD (2014) Mapping opportunities for professional development of university educators in Education for Sustainable Development: A state of the art report across 33 UE4SD partner countries. Authors: Mader, M., Tilbury, D., Dlouhá, J., Benayas, J., Michelsen, G., Mader, C., Burandt, S., Ryan, A., Barton, A., Dlouhý, J., and Alba, D., University of Gloucestershire, Cheltenham, 53 pp.